In my last post – How to Create a Project Management Risk Matrix – I walked through how to set up a Project Risk Matrix to help you and your team identify and plan for potential project risks. But project risk management doesn’t stop there. Project risk management involves activities throughout the execution of your project, as well. Managing risk is not something you spend time on only at the beginning when planning your project. You need to manage those risks along the way. The ultimate goal of project risk management is to ensure that you’re actually managing the risks. Identifying risks and laying out the Project Risk Matrix is only the first part. The Project Risk Matrix becomes your Risk Log and your risk management plan. And you’ll revisit the risk management plan regularly with your team. As the Project Manager, you’ll take a proactive role throughout the course of the project to assess and manage risks. After creating the Project Risk Matrix, do these following things as you execute your project to continue to stay on top of project risk management. 1. Look for identified trigger activities. During the creation of your Project Risk Matrix, you identified trigger activities. Throughout the course of the project, watch for any of the trigger events and be ready to act. 2. If any trigger activities occur, execute the plan you’ve laid out. This will be your signal to work with your team to carry out your plans to address the risk. If the risk mitigation strategy you need to implement impacts either cost, scope, or schedule, you may need to follow a formal change process. Be sure you’re aware of what your organization requires for this. Additionally, ensure that your customer is fully aware of any impacts. And just because you’ve mentioned it to someone, don’t simply sit back and wait. Follow-up at a reasonable time to ensure that those responsible are carrying out the plan and addressing the risk. 3. Actively manage the Project Risk Matrix. As you move past potential risks, you can close them out and move them off your active list. It is important to continue to monitor and update the risk management plan and Risk Matrix at regular intervals during project execution. You could do this as part of regular team meetings. Additionally, you might meet with team members who can provide information about specific risks through the course of the project. Stay on top of the information and actively manage it. 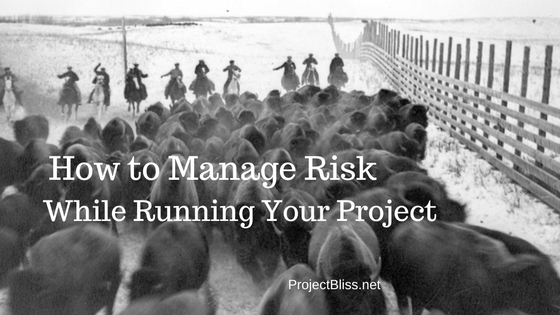 ProjectConnections.com shares that “Closure of risk issues—being sure that they’re truly handled and off the list—requires project team input since risks can impact many aspects of a project. Those whose work is dependent upon the resolution of specified risks need to be in agreement that the risk is truly mitigated, and will not impact their efforts after all.” Ensure that you communicate clearly and get agreement from all involved that risks are adequately addressed before changing the status. 4. Continue to assess for any unidentified potential risks along the way. As you move forward in your project, situations and conditions might change, creating the chance for risks that didn’t exist during the initial planning phase. In addition to monitoring and managing risks, report regularly on current risk status to keep everyone well informed. You want to avoid surprises along the way. Communicate to all necessary parties when trigger events occur. When you need to carry out any risk mitigation plans, share this information with relevant stakeholders. In large organizations, you may not have easy access to high-level executives with ultimate decision-making authority. It’s important to know when and how to escalate if necessary. Use your management chain-of-command to move large issues/risks up the escalation path if needed. In my post on Escalating Project Risk, I address the importance of escalating issues during the course of your project. 6. If appropriate, create a dedicated Project Risk Management Team. You may determine that you need a Project Risk Management Team (PRMT) to actively manage the risks if the project is large and a dedicated team is needed. This team would be responsible for carrying out activities to proactively manage the identified project risks. Project risk is inevitable, no matter the size of your project. By proactively managing for it, you’ll be more confident when it occurs, and ready to lead your team through the needed changes. If you found this helpful, please share. And let me know if you’ve got questions or project risk adventure stories of your own. I’d love to hear them!